That ‘scoop of ego’ will get you every time! Hehe, I’m not sure I’d recommend it as one of your five a day! Definitely served cold. Love it. Love your blog. More of a vicchissoise 🙂 Thanks for the visit and the comment. Wow! this is strong, we got the right colour, red like blood! Thank you. 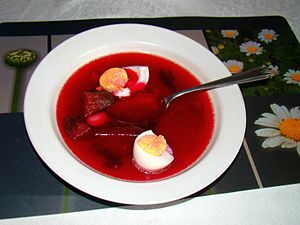 The picture is beetroot soup, which is actually gorgeous – though I wouldn’t serve with the random boiled egg! Nor I. I found it interesting, U wrote using a similar metaphor yesterday in my “Situational Perspectives”. Its amazing what floats around the collective conscious. Peace WW. This was one the menu at the Bankers Convention this year – they loved it. You have exposed all that ails the world in a simple soup – well done indeed.